Good afternoon, BB addicts! The HG's were woken up around 9am BBT this morning and then the live feeds switched to trivia around 10:55am BBT. It looks like we have a Veto Comp underway! This is a crucial veto for McCrae; if he wins it, he stays. If he doesn't, he'll be sent off to the jury house. It's that cut & dry this week. The Exterminators are very solid in their alliance. **While we wait...I just wanted to thank every single person who has either bought the feeds via the blog, those who have ~**donated**`~ to support it, and a huge thanks to those who have done both! You guys & gals have kept me here all season long to blog for y'all!! If you like the blog & would like to see me return next season, please consider making a donation to support the blog & keep me coming back!! :D Thank you!!! Spencer/McCrae are talking about who they should get out: Judd or GM. Spencer: "GM or Judd could go f**cking nuts." Spencer said they have to figure out who to get out; Judd or GM. Andy: "Congratulations, by the way." Andy: "I wonder why Judd was so against you winning." McCrae: "He was like if I win, don't be excited, play it up." Spencer: "Us moving forward, whoever we keep, the other one is gonna be mad at you. It has to be a..."
Andy: "What do we say to them? I'm chicken sh*t when they come up to me..."
McCrae: "And they'll compare notes..as long as it's unanimous.."
Andy: "There's pros & cons to both (GM/Judd)...GM is broken.."
Spencer: "But she doesn't give up. Judd will just lie down." They're going through the pros/cons of both GM/Judd. Judd is now in the HOH room with Andy/Spencer/McCrae. Spencer: "How did GM cut her leg??" McCrae/Andy are downstairs. They ask GM if she needs anything to drink or anything. She says no. McCrae said he doesn't know how she banged up her knee so bad. GM said the medic said she'll need stitches. GM: "If you send Judd back to jury, I'll be so appreciated." GM thinks she hit her knee on the ramp in the veto comp & cut it open. GM: "I can't even walk on both legs, I need f**cking crutches." BB: "GM, please go to the Diary Room." Andy offers to carry her in, she declines. McCrae holds open the door for her. Andy: "Oh my god, Final 4! I serously don't know what we should do!" They start going through scenarios. Andy: "I think the 2 of us have a better shot at winning the game than Spencer." They both agree that it'd be an "easy way out" to drag Spencer to the end & that the jury wouldn't respect that. They're still going back & forth on who to send to jury this week. McCrae: "If we get Judd out, we need to keep him in the dark. If it's GM.."
Andy: "I wanna see how broken she is." Spencer: "Why don't you get out of your costume?" Andy: "Because I feel beautiful in it." Judd is worried he's going home. Andy is telling him he's not. Andy/Spencer are talking who should go this week. They both agree that once they decide who will go, to tell McCrae about the Exterminators. Spencer: "But then he might feel like we might take him further." Andy: "But I don't want him to find out from someone else." Spencer: "Judd could be telling him right now (downstairs)." Andy thinks GM would be better to keep because she's "broken". Andy: "I wish I just had 5% more faith in Judd.."
Andy: "If Judd makes it to the end, I think he could beat either of us." 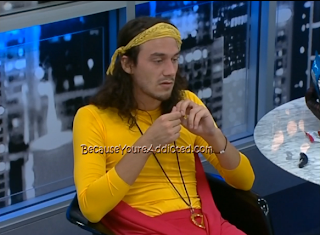 Spencer said that if they tell McCrae about the Exterminators, they'll have to get Judd out then. Andy is worried that if Judd stays, then he (J) will win the game. Andy: "I'm always worried about him. I do think both of them would take us over McCrae. Judd really thinks he's going home?" Spencer: "Yea because GM is so beat up. I'll be honest dude, but McCrae is in the Final 4. None of us are less guilty about (being in the alliance)." Andy: "But I feel he's gonna be most mad at me." Spencer: "Judd knows the dates better than GM." Andy: "GM counts on her f**cking hands." They're both going back & forth...GM or Judd. Andy: "And it comes down to McCrae, what he wants to do, too." Spencer wants Andy/McCrae to decide who will go to jury, he doesn't wanna break a tie & have someone mad at him. They're still going back & forth. Spencer: "I'll be honest with you dude, I'm scared that if me and you on the block and GM is the only vote, that she'll vote me out over you." Spencer: "I'd rather lose to you, you deserve to win the game. If I was at home, I'd be a fan of yours. I don't know what Judd would do, but I do know what GM would do. And if we tell McCrae (about the alliance), I'd want him to act like he doesn't know." 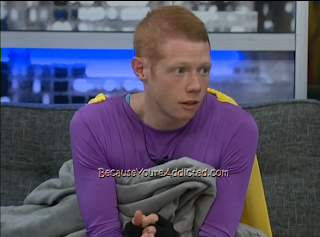 BB: "Andy, please go to the Diary Room." Spencer said he's gonna go downstairs and talk to Judd, tell him he's safe this week. Andy is still not sure what to do. *NOTE: GM never came out of the D.R. & Andy was called in. GM is now out the D.R. GM said that they called Andy to help her out of the D.R. Andy to Judd: "You're staying. That's where my mind is right now." GM is in the HOH taking a bath. Judd: "I'm not putting that (Superhero costume) back on for the D.R. They can go to hell." Spencer is telling Judd that he's staying, GM will go. Andy tells Judd that he will keep Judd and hopes McCrae or Spencer will, too. Andy just wants to make sure that if Judd stays, that he'd cut McCrae before him/Spencer. Judd said he will. 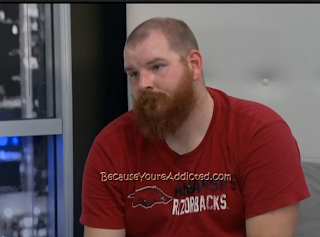 Andy said GM will be mad at him but he's gonna keep Judd. Meanwhile, Spencer is talking to GM up in the HOH room. Spencer is telling her that nobody can beat Andy in the end & that he wants to be her "Nick" in the game from here on out. GM is crying. Spencer & GM shake on a Final 2 deal. Spencer: "I'm gonna tell Judd that I told you it's up to Andy/McCrae's (votes), but I got you no matter what." GM said she's good on her word. At 2:15pm BBT, they hug. Spencer says he's loyal to the end with her. They both leave the HOH room. Judd is saying that he's gonna have to act like he's on McCrae's side. Judd: "I've talked sooo much sh*t on McCrae." Judd said it'd be a "f*cking nightmare" to go to the Jury House with "all those girls" in it. GM enters. Game talk stopped. GM said that she's gonna get stitches in her knee in a couple of hours once the doctor gets off of work. All 3 of them talk about the veto comp. McCrae is still in the D.R. I believe. Judd is in the living room on the couch. Spencer just got out of the shower. McCrae is in the HOH room as well. He's about to shower. McCrae said that Judd is already campaigning to him and he (Mc) still doesn't know what to do..doesn't wanna say too much about because he's afraid of Judd using anything he says against him. Spencer agrees. Spencer: "If Judd thinks he's going home, he's gonna be trying to make deals & sh*t."
McCrae: "If it's Judd that we're getting rid of, we'll have to blindside him. If it's GM, we should just tell her." Spencer: "Go take your shower, we have 100 hours to talk." Spencer: "If I put you up, don't.freak.out! GM is busted up and..if you freak out, it'll make things worse for you." Thank YOU for doing this! It's kept me going in between episodes! I'm guessing this POV will be physical because FartBlossom still has a sore foot, and Jugg will be musclesore from all the exercise, so I think BB isn't keen on either of those two going to the end. I am confused as to what is to take place the next week. I know someone is being evicted on Sun or Mon (shown on Wed episode) but will there still be an eviction Thursday? If there are still 4 left Friday how does it get to be final three by the 18th? Tues (most likely) the HG's will have an eviction, making it the Final 4. I have 3 websites I go to for my BB fix. This is the ONLY site that updates things making it my favorite BB site! Thanks for all you do. yayy that's awesome, August!! :D Thanks so much for the kind words!! He has GOT to win this! He better fight for his life & steamroll the Exterminators, one by one...starting with ole FartBlossom (lol @ CRAIG MARSHALL), & ending with Andy, who should be with him @ the end (F2). Thank you, Jamie, for your always accurate and up to the minute BB blog! You ROCK! Wish I could donate; unfortunately, my fiancé and I are now on a 1-person income. :/ Keep it up!! Please be here next season! Thank you so much, Catty!! I really appreciate your kind words! :D So sweet! I've been there before (2 incomes down to one), it's a tough battle to fight, I know. You hang there, it WILL get better!! He has to win this and FIGHT for his LIFE! Then he needs to steamroll the Exterminators 1 by 1, starting with FartBlossom (lol@CRAIG MARSHALL), and ending with Andy, who deserves to be next to McCrae in the F2, imo. Love your blog, Jamie! Wish I could donate; unfortunately, right now my fiancé and I are surviving on my income alone. :/ Keep up the great work;your blog is one of the most accurate & up-to-the-minute reliable ones available! Hope you're back for next season! He did it! Now, it's time to pick them off slowly & painfully-lol! Andy/McCrae aughtta be making some sort of deal right about now, I would think. Couldn't be happier for McCrae. Rooting for him to go all the way!! No one else comes close to deserving the win!! YES! I'm more excited now then I've been all season combined! The biggest hurdle in the McCrae Magical Mystery Tour is complete. Now he needs to win 1 of the 2 comps before the next eviction and he's practically guaranteed to be in that Part 3 of the Final HOH. Now that McCrae has the POV (WELL DONE! ), I hope either FB or Jugg spills their guts about the exterminators. Both McCrae and Andy agree that it would be the 'easy way out' to take Spencer, so I think that's the way either of them will go despite their highminded rhetoric. Andy is lobbying, but I hope either FB or Jugg rat him out to McCrae before he does something else stupid. If I'm GM or Judd, I clue in McCrae, right now, about Andy's betrayal. And then hope the two of them together can influence Spencer's renom. Jamie, I haven't thanked you yet for this blog! You are so appreciated!!! I only found you a month ago and now.....well I've got 3 little ones and this is a relief when I have to spend hours watching Team Umizoomi:-) I really do get a bit TOO distracted in here,lol...thanks for all your hard work!! Jamie, I just hit the tip jar. It's not much, since I'm out of work, but I wanted to thank you for all you do to keep us BB fans updated. But even more than that, THANK YOU for making your site a friendly, positive place to discuss the goings-on in the house! This is a safe haven from all the ugliness out there. Thanks somuch for your blog! I sneak onto the bathroom at work to read it! I am addicted to you it wouldnt be the samewithout you! Thanks so much! Kaycee: I just got it! Thank you SO MUCH for your support & for the kind words!! :D You're awesome sweetie! Gabrielle: hahaha that's awesome that you sneak away to read the blog!! :D Thank you for your kind words, love!! How do they select HOH after the Tuesday eviction? Is there a POV on Thursday before final 3? Apparently Jugg dropped out of the veto, telling Andy he didn't understand the instructions. I recall earlier in the season Jugg confessing that he never understood any of the instructions when Julie Chen would conduct a HOH competition. And now he's sulking. I hope his partners in crime follow through and blindside him and send him back to his rightful place in the jury house. FartBlossom doesn't have much of a chance because she is hobbled, and she has to count on her fingers so it would be difficult for BB to construct a challenge that she could win. Yes!!!!! Has to be GM going. Or at least I hope. Your stupid moves have cost you a Final 3 spot. I JUST NOTICED THIS COMMENT FORM FROM WATCHING THIS BLOG ALL SEASON!). I WANT TO THANK YOU FOR BEING THE BEST AT IT, FOR MY MONEY. What do the comments about GM counting on her fingers have to do with her winning HOH? I'm pumped that Mcrae won the veto. I think he's my favorite, he seems like a nice guy overall. Plus hard to imagine GM winning at the end.. I've delivered myself when my middle daughter was a toddler....it really isn't a "bottom of the barrel" job and I'm sure it isn't his "goal career"
Judd's really had a terrible nasty attitude since he came back especially towards production. You'd think someone who was given a 2nd chance to come back into the game from Jury to play again would be more appreciative and grateful. I've actually seen some youtube videos of McCrae doing some production/commercial type stuff. It's low key, but clearly a hobby/goal of some sorts. I hope he wins. Amanda screwed up his game, but he's the lesser of all the evils that are left. Spencer is so disgusting. No wait, GM is so disgusting. Now let me think, maybe it's Judd that's the disgusting one, lol. Andy has been saying some pretty disgusting things on the feeds tonight, so there really isn't anyone good left to cheer for. Go McCrae? The comments about GM counting on her fingers is if a comp has anything to do with counting, or dates, she can't do the math in her head, she counts her fingers. That's slow. I hope Jugg melts down. Other HG talked about how it's not good mixing xanax and beer. Amanda screwed up McCrae's game? To me it looked like she carried his lazy self for 2 and a half months, and he pulled the stops out when his game was finally threatened. Yeah, sorry, but Amanda gets at LEAST half credit for McCrae being in the final 4... or final 2 if he makes it. @Rebecca, last night McCrae likened his gameplan as like playing chess, where your queen is the most powerful piece and does most of the protection and damage until late in the game you may have to sacrifice your queen to win the game. Who cares anymore? I'll scream if Andy wins! And all this Elissa bashing from degenerates. I guess I'm for McRae but it just seems like it's floater season. Rebecca, I agree with you. "A queen always protects her king". Amanda was out front protecting McCrae. Without her during this game I am pretty sure McCrae would have been gone long ago but we will never know. Amanda played a significant role in getting McCrae where he is today. They were seen as a power duo to be used for votes and they were also instrumental in deciding who the "house" would vote out. Even though they were a power duo, Amanda couldn't win comps and McCrae was seen as neutered by Amanda so he wasn't a threat either but, again, they were influential votes. I'm not the only one who can't understand what Judd is saying when he speaks. Last night on BBAD I turned on subtitles for the hard of hearing. He mumbled something about Coke rather than, what the subtitles heard, "Sprate" instead of Sprite. Where does all of this horrible language come from? I thought there was a night a week or so back when McCrae was saying some really, really disgusting things regarding Elissa. So really everyone is gross to me at this point. I don't know where they learned to speak....or when he was a child why was he not given speech therapy?! I watch with closed captioning on all the time(because my Hubby is asleep next to me , also because there's so much whispering) they mess up everyone's words all the time but he and GM just blow my mind. I thought it was funny how during GM's nomination speech it was JUDD ,of all people, who had to give her the word she was trying to spit out! ....he really does have a terrible attitude since he's been back....you'd think he would be the most grateful and respectful....America's vote has gone down 10% in the last week for him....he would've done better to stay in jury! It's funny to hear how indignant he is when they told him Elissa wanted him out....did he not want HER out? Does everyone else not want.everyone else out....isn't that the game?